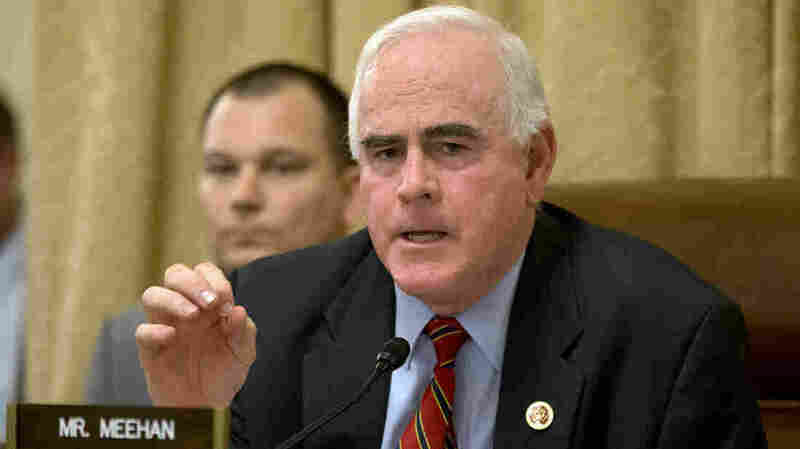 Rep. Patrick Meehan Defends Himself Against Harassment Allegations, Says He Saw Aide As 'Soul Mate' Rep. Patrick Meehan, R-Pa., told WHYY that he never crossed a sexual line with a former aide who has accused him of harassment, but he did talk of the deep "affection" he felt for her. Yet that is exactly what Rep. Patrick Meehan, R-Pa., did in an interviews with member station WHYY, The Philadelphia Inquirer and other local outlets just days after a New York Times report that he had settled a claim asserted by a much younger woman who worked in his office using taxpayer-funded money from his office fund. Instead, it's Meehan who decided to air the facts — and they don't appear to exonerate him. The matter is being investigated by the House Ethics Committee — which Meehan sat on until House Speaker Paul Ryan, R-Wis., recently asked him to step down from the committee after the Times report. "I've been up front that while we worked together, that there was a growing affection, that I wanted to make sure. ... that I would never cross that line," Meehan said. However, he admitted that "it was something that, from time to time, I struggled with." Meehan told The New York Times that he felt as though the young woman had "specifically invited" their communications and relationship. As for calling the woman a "soul mate," Meehan explained to WHYY that phrase simply "related to the kind of kindred spirit that was going through these experiences that we shared together," noting that the woman was a kind of gatekeeper for whom he would see during the day and the first person he would see when he got to Washington, D.C., and the last person he would see before he departed for home. They shared "a lot of humor," he said, and she showed "grace under pressure." Still, he admitted to the Inquirer that when she started dating another man seriously, he acted "selfishly." Meehan said that if he was acting "rough" in his office or lashed out at all, it was driven by stress he was experiencing over intense votes last year, including GOP efforts to repeal and replace the Affordable Care Act, also known as Obamacare. The congressman invited his aide out for ice cream, at which time he planned to tell her about his feelings. They shared a hug that was "maybe longer that night than needed to be" — and then Meehan felt it was all right to write her a two-page heartfelt note about how deeply he cared for her. In the letter, the GOP legislator sounds happy for her new relationship and tells her how lucky her new boyfriend is. "As you bask in this moment of extreme joy I want to share with you my sentiment of how richly it is deserved. You are kind and sensitive and caring and infectious with your laugh. You are and have been a complete partner to me and you have brought me much happiness," Meehan writes. He also talks about visiting the Vietnam Veterans Memorial after they got ice cream and finding a fallen soldier with the last name Meehan, and another nearby with the same last name as the aide's. "As I traced the monument with my finger, I wondered who they were and why their plans ended so sadly and abruptly," Meehan writes. "As we travel our paths together, I am comforted that there is more unwritten." The congressman signed the note, "With all of my heart, Patrick." In a text message the next day, the aide says she found his note in her drawer and thanks Meehan for his "very kind words and for your friendship," adding a smiley face emoji. To Meehan, all those things show that the woman was not uncomfortable with their relationship, and he is now speaking out so candidly so he can defend himself, being advised by his attorneys that the confidentiality agreement was breached when the woman's attorney spoke to the Times. Meehan also calls the payout to her — which he has since said he will repay to his office fund — "severance" and not a "settlement." "That I would find later that that was not something that she was comfortable with, really hurts me," Meehan told the Times. "This was a person who specifically invited communication with me so that she would be able to have the ability to be there for me." Alexis Ronickher, an attorney for the woman who has accused Meehan of harassment, said in a statement that, "My client has repeatedly requested that Mr. Meehan cease discussing this matter publicly and honor his legal obligation to keep this matter confidential, but he refuses to do so." "Her privacy is important to her, so she is not willing to discuss the fact of this case in the media. She intends, however, to fully cooperate with the House Ethics Committee investigation," Ronickher continued. Even amid all of this, Meehan insists he will run for re-election in November, which could give Republicans a new headache to worry about. Meehan sits in a swing district in the Philadelphia suburbs that voted for Hillary Clinton in 2016, and he was already a top Democratic target in 2018. The district's boundaries could change after the Pennsylvania state Supreme Court recently struck down the state's congressional district map as a violation of state law and ordered new districts to be drawn before Feb. 15. The ruling also prohibited the current map from being used in this year's primaries or general elections in November. The allegations against Meehan — and his frank admissions about the emotional attachment he had with the woman — might not help his case to voters.